Liborio Padula, son of Costanzo Padula and Rosaria DiTomaso, was born on December 18, 1882, at Frosolone, Isernia Province, Molise, Italy. He married Domenica Immacolata Preziuso, daughter of Giovanni Antonio Preziuso and Caterina Mainella, on June 16, 1908, at Frosolone, Italy. Liborio died on July 21, 1960, at his home, 26 Fairport-Nursery Road, Painesville Township, Lake County, Ohio, at age 77. His body was interred at Riverside Cemetery at Painesville, Lake County, Ohio. Liborio Padula is cited on a passenger ship manifest re-entering the United States on March 8, 1909, at age 26. He was travelling to Painesville, Lake County, Ohio. Liborio was escorting his wife, Domenica Immacolata Preziuso, to America. They arrived in the United States at the Port of Boston aboard the ship SS Romanic. Liborio Padula registered for the World War I Draft on September 12, 1918. He was living at Painesville Township, Lake County, Ohio. Liborio was employed as a self-employed farmer. Liborio Padula was enumerated for the 1920 Census of the United States, on January 9, 1920, living at Fairport-Nursery Road, Painesville Township, Lake County, Ohio, as a head of household. Liborio Padula was enumerated as Liborio Padullo. Liborio Padula was enumerated for the 1930 Census of the United States, on April 15, 1930, living at Fairport Road, Painesville Township, Lake County, Ohio, as a head of household. Liborio Padula was enumerated as Liborio Padula. Liborio Padula was enumerated for the 1940 Census of the United States, on April 4, 1940, living at State Route 535, Painesville Township, Lake County, Ohio, as a head of household. Liborio Padula was enumerated as Liborio Padula. 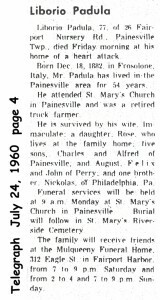 Mr. Padula was employed by the Storrs and Harrison Nursery Company, and also operated a truck farm on Fairport-Nursery Road. 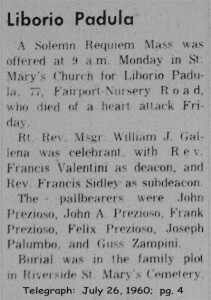 Liborio’s sister, Maddelina Padula, lived in Painesville from 1900 until her death in 1928. His brother, Michele Antonio Palumbo lived in Cleveland. 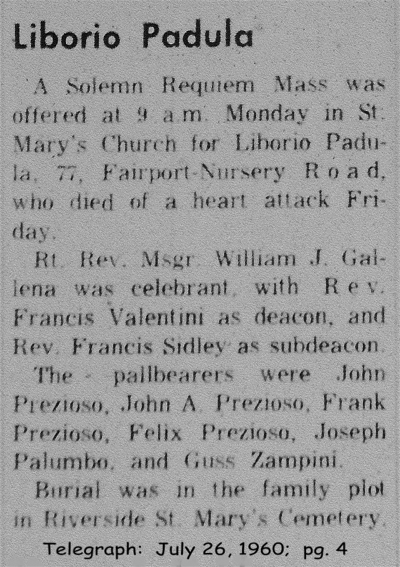 His brother’s, Rocco Padula and Nicola Padula, lived in Painesville in the 1910’s. Liborio’s older sister, Maria Carmina Padula, did not immigrate to the United States, but her four children did immigrate and lived in Painesville. 1. Costanzo Padula was born on June 17, 1910, at Ohio. Costanzo died on September 7, 1913, at Painesville, Lake County, Ohio, at age 3 because of a fractured skull due to a motorcycle accident. His body was interred at St. Mary Cemetery at Painesville Township, Lake County, Ohio. 3. 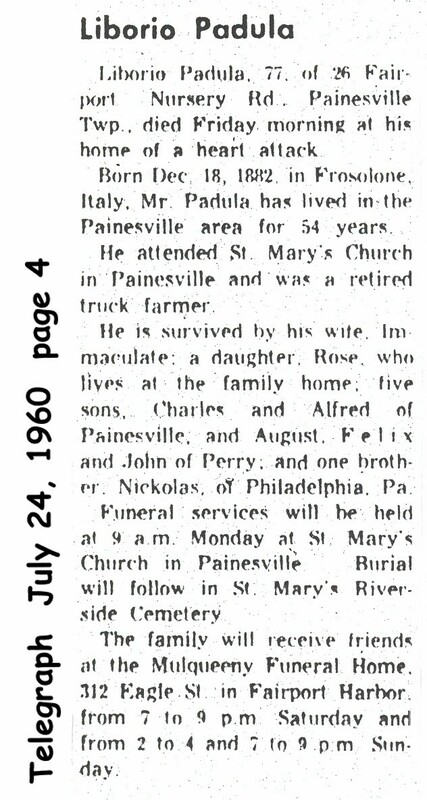 Augustine N. Padula was born on July 5, 1915, at Ohio. He married Angela Marie Loparo, daughter of Santo Loparo and Michelina Mercurio, on June 2, 1943 at Cuyahoga County, Ohio. Augustine died on October 27, 1998, at age 83. His body was interred at Perry Cemetery at Perry Township, Lake County, Ohio. 4. Felix A. Padula was born on August 26, 1916, at Painesville, Lake County, Ohio. He married Janet Marotta, daughter of Guistino Marotta and Albina Ostoma, on June 15, 1940 at Lake County, Ohio. Felix died on January 26, 1999, at LakeWest Hospital, Willoughby, Lake County, Ohio, at age 82. His body was interred at Riverside Cemetery at Painesville, Lake County, Ohio.